← 4-H and FFA: Vanguards of a Scientific Counterrevolution? 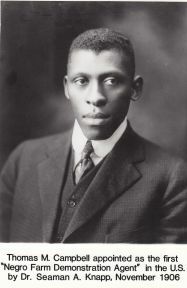 This entry was posted in Cooperative Extension Identity, Land-Grant University and tagged Booker T. Washington, Cooperative Extension, First Cooperative Extension agent, Jim Langcuster, land-grant universities, nontraditional education, reginal universities, remedial education, Thomas M. Campbell, Tuskegee Institute. Bookmark the permalink.